Bullbuckers: Saturday, June 15 - Lakefest! Saturday, June 15 - Lakefest! 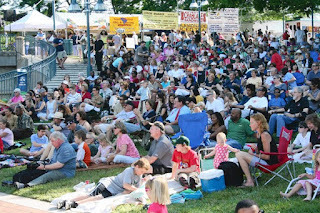 Columbia Festival of the Arts will kick-off with LakeFest, a free, three-day celebration of the arts, scheduled for June 14-16, along Lake Kittamaqundi’s lakefront in Columbia, MD. LakeFest averages over 25,000 people over the course of the weekend bringing together the people of Howard County and visitors from other cities, states and countries, through the annual celebration of the arts and artists.